View your medical records including: allergies, immunisations, investigations and more….. 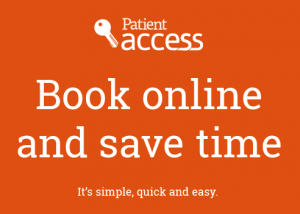 Patient Access is a 24 hour online service which you can access from home, work or on the move via the free app – wherever you can connect to the Internet. To register you will need to apply in person with 2 separate forms of identification (1 photo ID and 1 separate proof of address) and complete the ‘Patient Access Registration form‘. Examples of acceptable ID include a driving licence, passport, a recent utility bill (e.g. gas, electric, satellite, TV, phone bill) issued within the last 3 months, a bank statement, council tax bill for the current council tax year, mortgage statement. You can also request access to your Detailed Coded Record which allows further access to your medical record online. This requires another form to be completed for this level of access. These requests for further access will be considered on a case by case basis by your GP. If access is agreed, this can then take up to 30 days to be added to your Patient Access account. There is an information leaflet available at reception regarding accessing records online. The Detailed Coded Record Access forms are available at reception. If you require help, please check the Patient Access Support section by clicking here. If you are still experiencing issues with registering your details or accessing Patient Access following registration, please contact the practice by clicking here.